Al Ahli is comparatively a small riding club in the city, but offers various programs for beginners as wells as for experienced riders. This riding school is quite famous in Dubai, and provides several opportunities to the people so that they can learn the noble art of Horseback Riding. Besides that, they also offer many other leisure activities at the club for the whole family to enjoy. The management of Al Ahli also arranges classes and special programs for schools in Dubai. These programs eventually help students to learn and build confidence and communication skills rapidly when working around horses. Apart from that, knowledge about horses and fun history facts are also taught along with work sheets for the schools. Moreover, field trips and training classes are also organized. Al Ahli Riding School remains open for seven days a week, and its operational hours are between 9 am to 9 pm. Stadium Metro Station 2 is the nearest metro station to Al Ahli Riding school. It is 300m away from the centre, and by walk it takes around 4 minutes to reach there. Head northwest on Al Nahda Rd/D 93 toward Amman St/D 97. 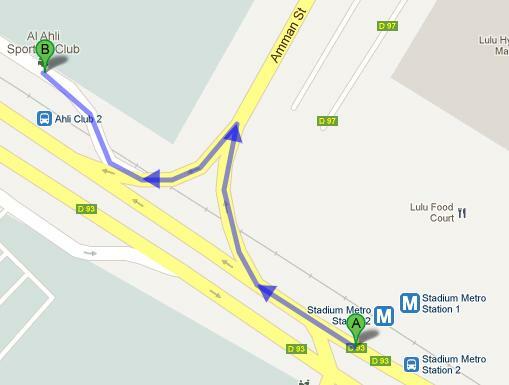 Then take a slight right onto Amman St/D 97. Now take sharp left to stay on Amman St/D 97, and then take slight right where you can easily locate your required destination.